While using the KDE LaTeX editor Kile, I see a launcher item "kuiserver" popping up every now and then. This shouldn't show up in the launcher bar. I currently cannot test if that's also a Unity issue. Thanks for the report Hernando. 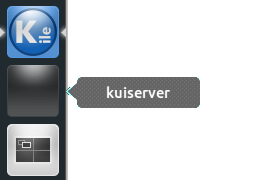 Does kuiserver have a visible user window? Does that issue occur with Unity? Sorry about my silly question "Does that issue occur with Unity?". I know you cannot test right now. Let's see when Unity works for you again. I'm running Unity now but I'm not sure how to trigger that item to appear. Just running 'kuiserver' doesn't seem to be enough. And no, it has no visible user window. this does not happen with unity(3d) i have never seen such behavior though i saw it with unity-2d myself as well. I believe it not to be BAMF bug rather a unity-2d issue. "while using the KDE LaTeX editor Kile, I see a launcher item "kuiserver" popping up every now and then."